Olivia and Carter were sincerely honored to be guest speakers again this year at the 2012 Caring for Creation Conference. The conference is held at Lake Junaluska Conference and Retreat Center which is operated by the Southeastern Jurisdiction of The United Methodist Church. The mission of Lake Junaluska is to be a place of Christian hospitality where lives are transformed through renewal of soul, mind, and body. 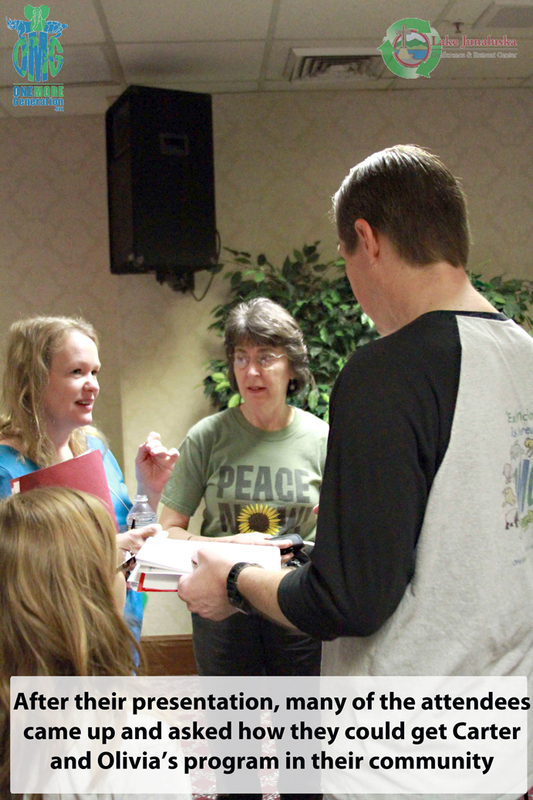 This year’s event was designed to offer an experience for laity and clergy addressing how the faith community can promote justice for Earth and all living things. 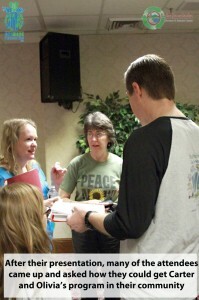 The event offered participants the opportunity to discover their residential and faith communities’ role in environmental care. 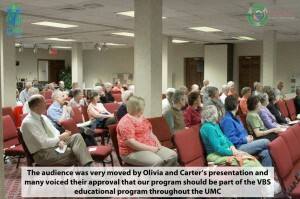 The event offered over 20 workshops on topics such as “A Biblical Theological Foundation for Creation Care” to “Faith Principles of Creation Care” and, of course, our specialty “Environmental Stewardship”. 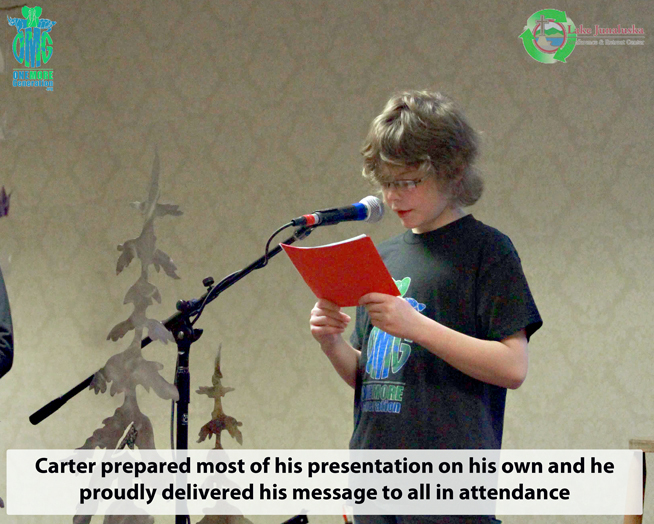 The goal for having OMG present at the conference was to share our environmental education work with the various church representatives and afford them the opportunity to see how our Plastic Awareness Week curriculum program could possibly be introduced into their congregations. Our intent is to help explore ways individuals and churches can become more environmentally conscious and good stewards of God’s Earth. In todays climate, it is essential that churches get involved in environmental justice. Our program is a step in that direction and one that affords children the opportunity to get involved and feel empowered to be the solution to the issue of plastic pollution. Olivia and Carter have devoted much of their free time to helping bring their message to students across the country. 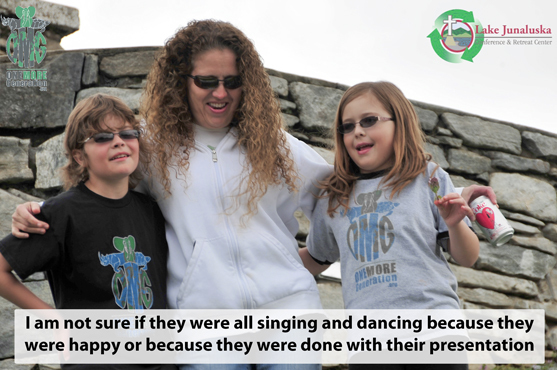 They love speaking with kids and showing them how easy it is to get involved with making a difference. The Plastic Awareness Week curriculum has been broken into five distinct learning segments, all of which are designed to educate students on the real effects of Plastic Pollution. We have incorporated simple changes that each child can introduce at home, in their schools and even in their community that will have an immediate and lasting impact. We have conducted our Plastic Awareness Week program in schools and churches across the country and our program is now available to schools, churches and other organizations nationwide. This is just another way OMG is reaching out to communities to affect change. If you are interested in exploring OMG hosting one of our environmental outreach programs or our Plastic Awareness Week program in your church, school or community, please send us an email and we will gladly work with you on making that happen. Among the many participants who spoke-up in support of our Plastic Awareness Week curriculum program were Mrs. Delia Halverson, who is a Christian educator and author of numerous books about teaching children and more. Mrs Halverson and many others voiced their interest in seeing our program possibly being introduced throughout the United Methodist Church VBS program. Also in attendance this year was Martha E. Pierce who is the Director of the Riverside Retreat in LaBelle, FL which is where Olivia and Carter taught their Plastic Awareness Week program last year to the attendees at the VBS camp. 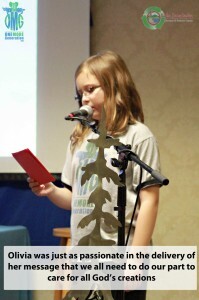 Martha was able to express first hand the immense impact our hands-on program had on her students and she even said that many are still actively involved with trying to care for the environment. 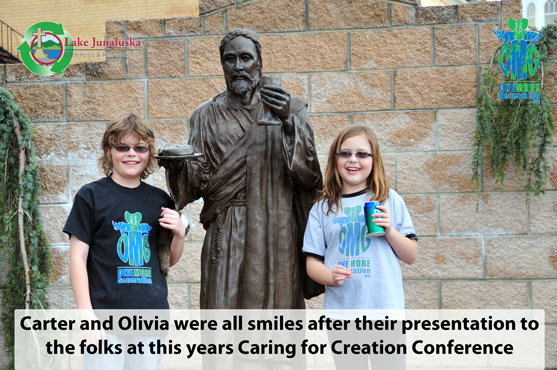 Carter and Olivia thoroughly enjoyed this years Caring For Creation event and we hope we were able to inspire others to also get involved with helping their church communities seek solutions which will help them protect all of God’s creations. 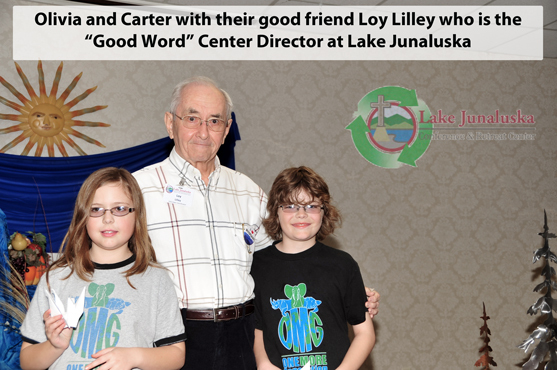 After the presentation was over, Olivia and Carter insisted on walking the grounds of the beautiful Lake Junaluska facility and to take time to reflect on all the great comments they received about all their hard work. We wish to thank Loy Lilly, Dr. Michael Black and the entire staff at the conference for their hospitality and for inviting us again this year. We hope to have the opportunity to come again next year.